My company has been running a GO tournament and since its around NCAA March Madness time I thought it'd be easy to find a site to manage the draw. I looked but couldn't find anything that did what I wanted so I wrote my own. Caveat: I just spent a few days on this and it could stand to be enhanced with more features and a rewrite of the ui implementation but I'm open to suggestions if anyone finds this useful. Now when you view the site you'll see a draw that looks something like this. For games with 2 players - all first round games and games where the previous round winners have been determined - you'll be able to click the link and set which player won. 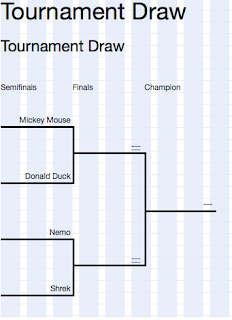 This was all very quickly thrown together but if you're interested in hosting any sort of single-elimination tournament check it out on github tournament-draw. Let me know if you use it and how you'd like to enhance it from the quick application it is today.